5 April 11 Are You Lactose Intolerant? Many people tell me that they won't drink milk because it gives them gas, cramps or diarrhea. 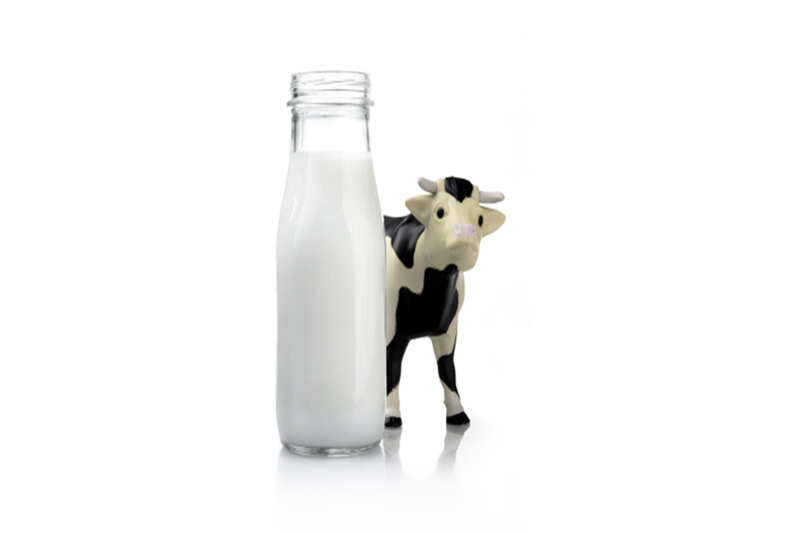 They don't have a milk allergy, but the gut discomfort is enough to turn them off milk and most milk products. What they have is "lactose intolerance" - a relatively common condition where one does not produce enough lactase (a gut enzyme) to break down lactose (milk sugar). Lactose is found in milk from all mammals, including human breast milk. Although babies tolerate lactose (except for those with certain rare genetic diseases), by adulthood many become lactose intolerant. Worldwide, it is likely that the majority of adults are lactose intolerant. Avoiding milk and milk products is just one strategy to avoid the gastrointestinal discomfort related to lactose intolerance. Unfortunately, avoiding those foods also means you are avoiding excellent sources of calcium and vitamin D.
Of all the food sources of lactose, fluid milk has the highest load: 1 cup (8 fl oz) of milk contains about 12 grams of lactose. One cup of milk also provides about 300 mg of calcium - about 30% of the 1000 mg RDA for most adults (postmenopausal women need 1200 mg of calcium). In terms of efficiency and cost, consuming milk is one of the easiest ways to meet your RDA for calcium. Three cups of skim milk provides about 270 calories, nearly 1000 mg of calcium, about 27 grams of protein, and about 50% RDA for Vitamin D. The cost of three cups of milk will vary by location, but a high estimate could be $1.13 ($6/gallon) and a low estimate could be $0.47 ($2.50/gallon). The nutrients will be virtually the same between organic and non-organic milk. People with lactose intolerance can typically tolerate 12 grams of lactose without symptoms. In addition to limiting serving size of milk to 1 cup or less, you can reduce symptoms if you consume milk as a part of a meal. If you can afford the extra cost, there is also lactose-reduced milk in most supermarkets. If milk doesn't appeal to you, then there are milk products that are much lower in lactose that are also good sources of calcium, vitamin D, and protein: yogurt (bacteria appear to break down the lactose), hard or aged cheeses (e.g. Swiss, cheddar, etc, < 1 gram lactose per 1 oz serving), and soft cheese such as ricotta (<1 gram lactose per 1/2 cup). Cottage cheese contains about 3 grams of lactose per 1/2 cup serving and a little less calcium than other milk products. Naturally lactose-free foods that are good sources of calcium include: calcium-fortified soy or rice beverages, calcium-fortified juice, sardines with bones, salmon with bones, calcium-set tofu, and low oxalate green veggies (e.g. bok choy, broccoli, Chinese cabbage, collards, and kale). Dark leafy greens (e.g. spinach), sesame seeds, almonds, and legumes also contain calcium, but phytic and oxalic acids found in those foods bind with calcium and reduce absorption. Be sure to check out the Academy of Nutrition and Dietetic position paper on vegetarian diets for more information on meeting nutritional needs from plant-based diets. Certain diseases of the gut, certain types of medications, radiation to the abdominal area and chemotherapy can temporarily cause lactose malabsorption. Tell your doctor or dietitian if you suspect that lactose-containing foods are causing you grief. Keeping a food record is an excellent tool to help you identify which foods and in what quantities seem to be associated with fewer or greater symptoms of lactose intolerance.